Shirts With Random Triangles: Peyton Manning gives show of support to Tennessee head coach Butch Jones. Peyton Manning gives show of support to Tennessee head coach Butch Jones. Peyton Manning at Manning Scholarship presentation with recipients Alex Crockett and Cody Sain, and UT Chancellor Jimmy Cheek. Photo via utsports.com. Tennessee head coach Butch Jones just got a major show of support from a truly important player in recent Tennessee football history - Denver Broncos starting quarterback Peyton Manning, who is making the rounds in Knoxville this week. "I think it's going in the right direction," said Manning, the 1997 Heisman Trophy runner-up. "I think Butch had a lot of work to do when he got here. He's put in that work. He's signing some of his players. Every coach wants to have their players. He's been patient. At the same time, he's been hard-working, as he was advertised to be. He's done that. I just see it continuing to get better. I really do." Manning's rounds in Knoxville on Monday included a charity golf tournament benefiting East Tennessee Children's Hospital, and his own PeyBack Foundation charity. 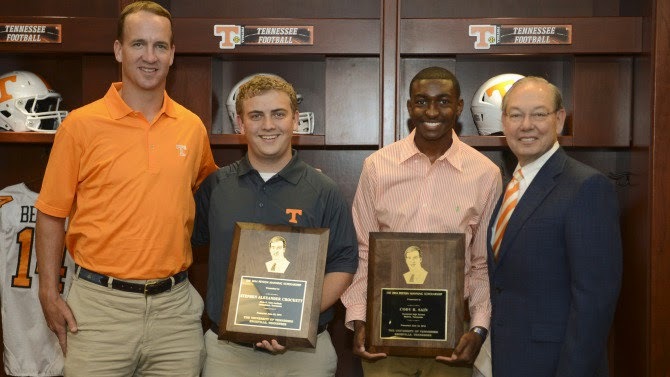 He also presented the 2014 Manning Scholarships to University of Tennessee students Alex Crockett and Cody Sain.